I have been wanting to try this painting technique for a while. Kindra over at At Home With K is a genius with a can of paint. And I am also continually inspired by Kristi over at The Speckled Dog. Her thrift store makeovers are amazing. 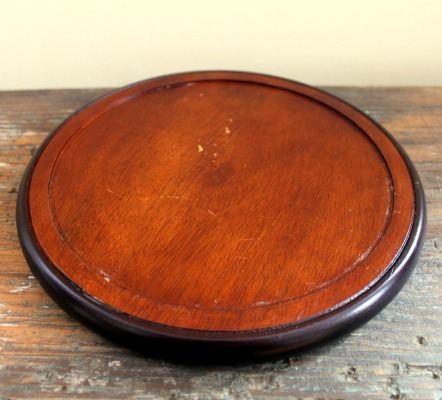 I painted the wooden plate with a spray can of Rust-Oleum Heirloom White. I did two coats. 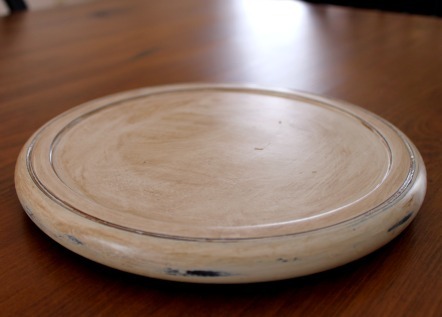 When that was dry, I sanded inside the nooks and crannies and around the outside edge to distress it a bit. 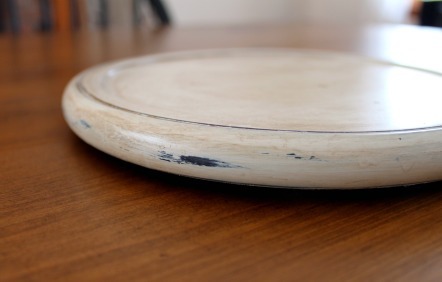 Then I followed Kindra's advice and rubbed MinWax Early American over the entire plate. I immediately wiped it off using clean paper towels. I love this piece! And I'm so happy with how it turned out for my first try at distressing and aging. 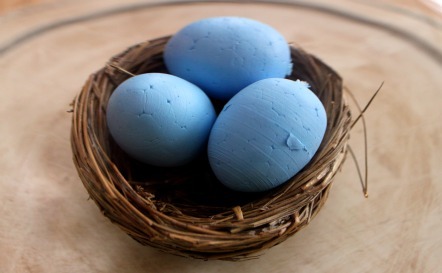 In preparation for spring, and after being inspired by this post that Kristi did, I added a little nest with three robin's eggs inside. I bought a sleeve of 20 little foam Easter eggs at the Target dollar spot for $2.50. They had ribbon attached to them for hanging, so I just cut the ribbon off. The nest was actually a decoration from my wedding almost ten years ago. I knew I had saved it, so I dug around until I found it. So, my $1.99 cheese dome was transformed into a beautiful spring centerpiece for less than $10. I love it! Kindra has started up a new link party called "Terrific Under Ten Tuesdays". Make sure you check it out and link up any DIY projects or great finds that you made or bought for $10 or less. Thanks for stopping by today! Looks great Gwen! I have trouble passing up those cheese domes when I'm out thrfting!!! That dome turned out beautiful! I have never been so lucky to find one with the glass intact. 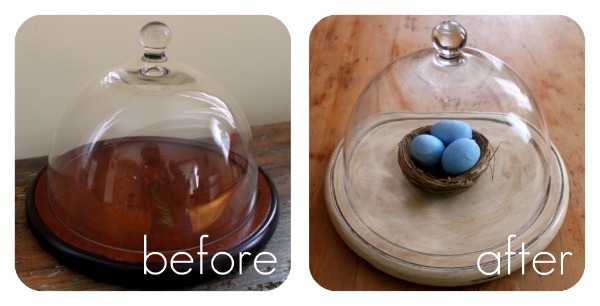 I love this transformation, as well as the sweet nest. It's perfectly imperfect!!! I love it! Have a great week! love it! i just got an identical one a couple of weeks ago for $1.99 too! YAY for thrift stores!! So simple yet so adorable and clever! Great job! I love it! Thanks for letting us know how you did it! I am so excited about your first makeover!! You wouldn't even know it was your first time...looks like a pro! Love it!! Thanks for linking up, friend! Nice work! You are so creative and what a find. The nest is a good reminder that spring is around the corner. Thanks for sharing. It turned out beautifully! So simple and perfect for spring! I have that same dome...may have to transform it like you did. Looks Great! I got one too at an auction last week for $2.00. Dumb me left the base behind! Figured I will just use a pretty plate. I love it; it's amazing what a little paint can do! My daughter hates when I drag her to good will; she wants to run and hide. Very cute! You did a great paint job! You did a great job! What satisfaction to find what you're looking for at Goodwill! I will have to check those other sites because I have this old window frame I want to do something with! A great little display case for all kinds of items..especially seasonal..as you've done! I have one of those in my projects to do bin, and hope to get around to it soon. Wow that looks amazing Gwen! Good job spying the cloche in the first place too! Great find! I love the nest. So simple and spring-y! Love it! I found a cheese dome at GW a couple of months ago but have yet to transform it. I'm inspired now! I just love the shape of the dome. 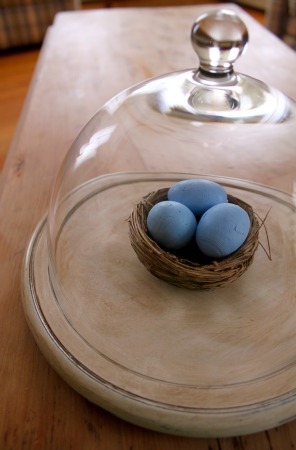 What a great find...and extra special with the nest from your wedding! Your cloche was featured today on my blog!! Congrats!! Love it! You did a fantastic job. I loved it so much I copied your nest idea! I made something like this TODAY and was looking online for similar images to link to on my blog. Ah, how great minds think alike! I love how simple your cloche looks. And thanks for helping me learn the correct term!